Having a knowledgeable inspector is key to filing a successful roofing claim with your insurance carrier. Sands Roofing & Construction offers a full inspection by a licensed insurance adjuster to homeowners in the Lexington and Columbia areas. Call us now to schedule your inspection 803-520-6154 or contact us online by clicking HERE . If you have roof damage we will due to a weather related event we will advise you to file an insurance claim accordingly. We will meet your adjuster at your home and show him/her the damage we found. 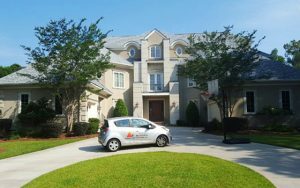 If you live in Columbia or Lexington SC and you have not had your roof inspected in the last 6 years, there is a good chance that you have roof damage of some type. We can make small repairs at the time of the inspection and help you make an informed decision about larger repairs if needed. We also offer seamless interior repairs of small water stains and drywall patching if needed.